The “kats” are back! Starting Thurs., July 3 at 8 p.m. ET/9 p.m. PT during Animal Planet’s month-long freeview*, Meerkat Manor mania returns to Animal Planet with a brand new feature-length special and a fourth season full of even more drama, romance and family fun! 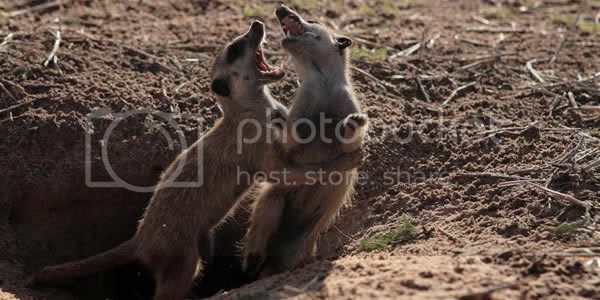 From seductive pairings to battles for dominance, Meerkat Manor captures the daily activities of these sociable creatures with specially-built fibre-optic cameras stationed both above ground and in the deep burrows below. Filmed in cooperation with Cambridge University, there are no humans in the series, only the real life drama, romance and action of the Whiskers meerkat family. The fourth season of Meerkat Manor kicks off Thurs., July 3 at 8 p.m. ET/9 p.m. PT with Meerkat Manor: The Story Begins, a 90-minute special narrated by Academy Award® -winning actress Whoopi Goldberg. Filmed over a seven-month period in partnership with Oxford Scientific Films/Southern Star, Cambridge University and world-renowned behavioral ecologist Professor Tim Clutton-Brock, Meerkat Manor: The Story Begins is a prequel to Meerkat Manor. The feature film traces the rise of Flower from a young inexperienced meerkat into a remarkable leader who puts her family above all in the fight for survival in the Kalahari, one of the harshest deserts on the planet. Viewers witness Flower’s growth as she raises her family and forges a legacy amidst the unforgiving landscape and constant dangers of the desert. Following Meerkat Manor: The Story Begins, the fourth season of Meerkat Manor settles into its regular timeslot beginning Thurs., July 10 at 8:30 p.m. ET/9:30 p.m. PT. Narrated by actor Bill Nighy (Love Actually, Pirates of the Caribbean), season four of Meerkat Manor will find out how the Whiskers cope in the shadow of the death of their fearless matriarch, Flower. In season three, the Whiskers were dealt a harsh blow when Flower died, and with the family in shambles, Rocket Dog fought her way to the spot as new leader of the Whiskers clan. But, mutineer Maybelline didn’t accept her sister Rocket Dog as queen and ditched the clan to form her own mob, the Aztecs. With the family divided, the sisters’ claws come out and the Manor is changed forever. With threats from predators, harsh desert weather and archenemies the Commandos, the lack of a strong leader to unite the clan could be their biggest obstacle in survival.